First impressions of a home often take place as you approach the front door, where you're eventually given a glimpse inside as soon as it starts to peek open. Though the front door has always been one of the home's main focal points, the designs have matured drastically over the years. 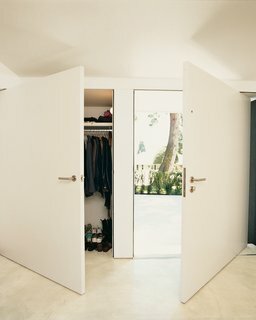 In many modern dwellings, traditional doors with excessive details have been swapped out for more simple, creative versions that fit the aesthetic of the home. Take a look at these 10 examples of refined, modern doors that welcome in visitors and residents alike. Designed by architect Ken Meffan, this home in the Sierra Nevada mountain range is a labor of love. Meffan, his wife, and their four children lived in a tent for two years, and a workshop for nine years, while he built the house himself. Meffan continued to add bedrooms as the family grew. 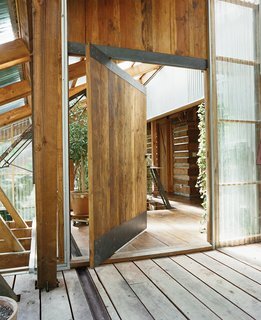 The front door of this home in Rough and Ready, California, is made from re-milled, leftover beams. A custom pivot mechanism allows the weight of the massive door to rest on a tiny point, allowing for almost friction-free operation. This front door opens up to a home that Kieran Gaffney and Makiko Konishin designed for themselves and their family in Scotland. 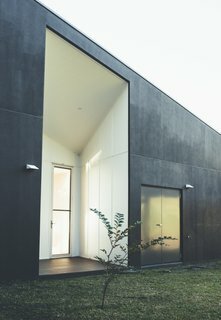 It's clad with charred cedar, an ancient Japanese technique that protects the wood against fire, rain, and rot. Here, the charred cedar effect on the front door is likely more aesthetic than preventative—though you can never be too careful. Designed by Teeland Architects, this minimalist, cantilevered home was designed to take advantage of the surrounding forest and views of the Pacific Ocean. They painted the cement exterior walls a dark color in order to help it blend in with the forest. The house uses solar panels and water tanks to function off the grid. Its waste water is recycled and used for irrigation. 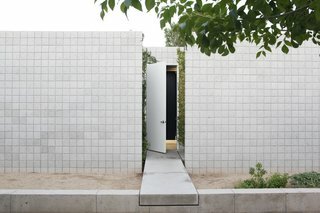 This door is framed with a massive, geometric opening that's both dramatic and minimal at the same time. Architects Melissa and Jacob Brillhart wanted their downtown Miami home to embody Florida modernism. 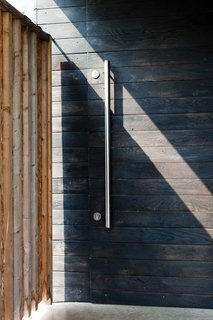 The shuttered front doors provide protection and privacy, while also allowing the home to open up and take advantage of the light and breeze. 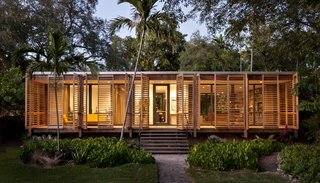 Behind the shutters lies four sets of sliding glass wall panels that can be opened to create one continuous room. Lightweight shuttered doors made of western red cedar line the outer edge of the front porch, providing privacy and protection from the weather. The wood is left unstained, so it will age naturally in a way that’s similar to the surrounding ipe wood. Just behind the shutter system, 50 feet of glass walls broken into four sets of sliding panels open to eliminate the barriers between indoor and outdoor spaces. This home was designed and built by two college friends—Jay Atherton and Cy Keener—who subsequently started their own firm. The minimalist space features two bedrooms and a connected living room. 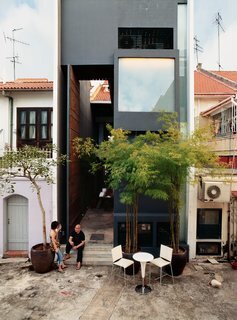 The west-facing facade is devoid of windows in order to keep the house cool in scorching temperatures. The front door is accessed by a 'floating' concrete bridge that bisects the two wings of the house. Originally designed by architect John Sugden, this Salt Lake City home was restored by Brent Jespersen and brought back to its original glory—but with modern additions. A meticulously manicured lawn complements the pared-down lines and massive front door. At night, the path to the door is illuminated by floodlights. When this 19th-century home was renovated, a gigantic front door was installed that swings open to create a natural flow between the exterior and interior. This historic home features a 25-foot door and large windows to represent a vastness of space, an idea that's both historic and modern. This rural Canadian home features reclaimed wooden planks and textured concrete walls. 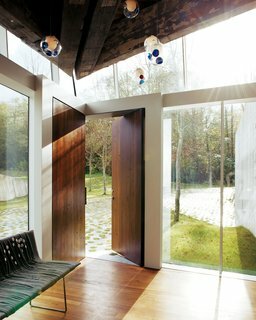 The home was designed by Omer Arbel to blend seamlessly into the surrounding landscape and capture light from all angles. Walnut doors with circular details come together to form a corner in the entry foyer. Architect Peter Cardew designed this overhaul of a split-level suburban home in order to simplify and modernize the existing structure and make it more energy efficient. 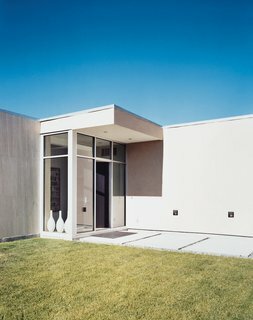 Oversized doors in the front entry create the sense of a continuous wall when closed. By re-angling the outside stairs and widening the front door to a welcoming five feet, the architect created an entry that feels both distinctive and generous. Although not a residential example, this door to the Museum for Architectural Drawing in Berlin provides ample inspiration. Designed by Russian firm SPEECH Tchoban & Kuznetsov, the door blends seamlessly into the building's ground floor exterior, which is lined with sketches that have been etched into the concrete facade. 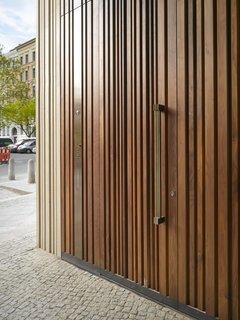 The wooden door mimics the structure's textured exterior.